I kind of slacked on One Local Summer this week. I was expecting an abundance of veggies from my CSA, which just started this past Monday, but instead all I got was a handful of salad greens, some garlic scapes, and a head of Chinese cabbage. It's been a rough, wet spring here in Virginia. So I headed to the farmer's market on Saturday (yesterday) morning to get some goodies for this week's local meal. To see what other people in my region (Southern) have been up to, check out last week's roundup! Those sausages look so delicious!! I love that you are doing the "one local summer" thing! It really is interesting how much tastier local foods in season are. There are always a few challenges with sourcing some local ingredients, which turns dinner into an adventure! 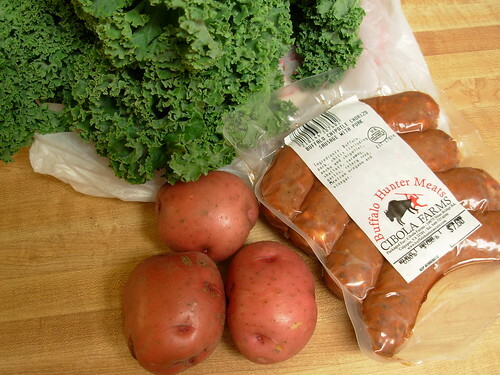 I buy sausage from the same people, They get to alot of farmers markets in NoVA. Goodstuff. I have Cibola Farms ground buffalo in the freezer - haven't tried it yet. My CSA in Middletown, VA got off to a slow start too, but I'm satisfied with what I'm getting from them (Echo Ridge).